Newsletter: GL Enhances T1 E1 Analyzer "Basic Software"
Welcome to another April 2015 issue of GL Communications' Newsletter. In this newsletter, we are highlighting the important applications added to the T1 E1 Analyzer Basic Software Applications. Previously many optional applications were priced separately, but now are part of the basic software. GL's T1 E1 Analyzer software applications are broadly classified as Basic Applications and Optional Applications. 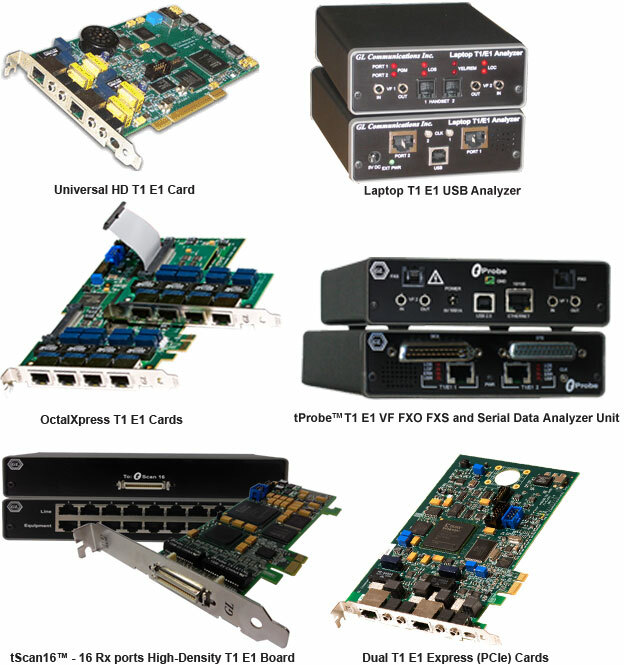 Basic Applications are part of the Main T1 E1 Analyzer Software and come with hardware, however Optional Applications require special licensing and pricing to use. The Basic Applications include all the necessary applications required for T1 E1 line monitoring and intrusive testing as part of the main T1 E1 Analyzer software. The Optional Applications include advanced testing features that require additional licensing to use. User can click the Basic Applications link to view a comprehensive list of applications supported by the T1 E1 Analyzer. GL offers the following important optional applications now as part of its basic applications, that means, users no longer need to pay for additional license to use the below applications and this in turn benefits significantly in terms of cost and adds tremendous value to the T1 E1 Analyzer software capability. GL's Universal T1 E1 Cards provide pulse mask compliance testing using Pulse Mask Display for both T1 and E1 applications. 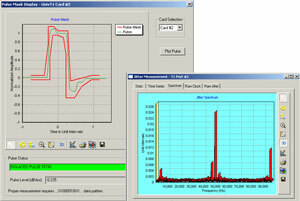 GL's Jitter Measurement module allows evaluation of jitter on either a tick-by-tick or a cumulative basis. Audio Monitoring application allows users to insert speech on T1 E1 lines using microphone and listen to the speech on T1 E1 lines using speaker (requires internal or external sound card to be connected to the PC). The Capture Dialed Digits application provides the capability to capture and display DTMF and MF (along with MFR2-forward and MFR2-backward) digits as they are received on one or several time slots. The Signaling Bits Recorder application works with one or multiple Ultra T1 E1 Cards or with the Portable T1 E1 Analyzers. Signaling bit changes are recorded for all timeslots simultaneously. A file may be specified for saving the captured signaling transitions. A previously recorded file may be viewed by "loading" the respective file. Client / Server applications allow the user (with an appropriate client) to operate analyzers remotely, write scripts for automation, or provide multi client connectivity to a single T1 E1 VF Data analyzer. Almost every GUI application has a Windows Client Server (WCS) counterpart. Our existing customers covered under warranty are advised to 'Download' the latest T1 E1 software during the 2nd week of May 2015 to take advantage of the above licensing changes!! All new customers can leverage this exciting new offer on latest T1 E1 software as many special applications are now available absolutely free!! Our valued old customers currently not covered under warranty can avail this golden opportunity!! RENEW your warranty and enjoy the benefits. Call us for a renewal quote. For comprehensive information on the applications, please refer to T1 E1 Analyzer Applications web page.